We left Sigirya with happy feelings and we were exited for the next days. Kandy and Ella were our next 2 stops. But first we did a stop at a Hindu temple, Muthumariamman temple in Matale. 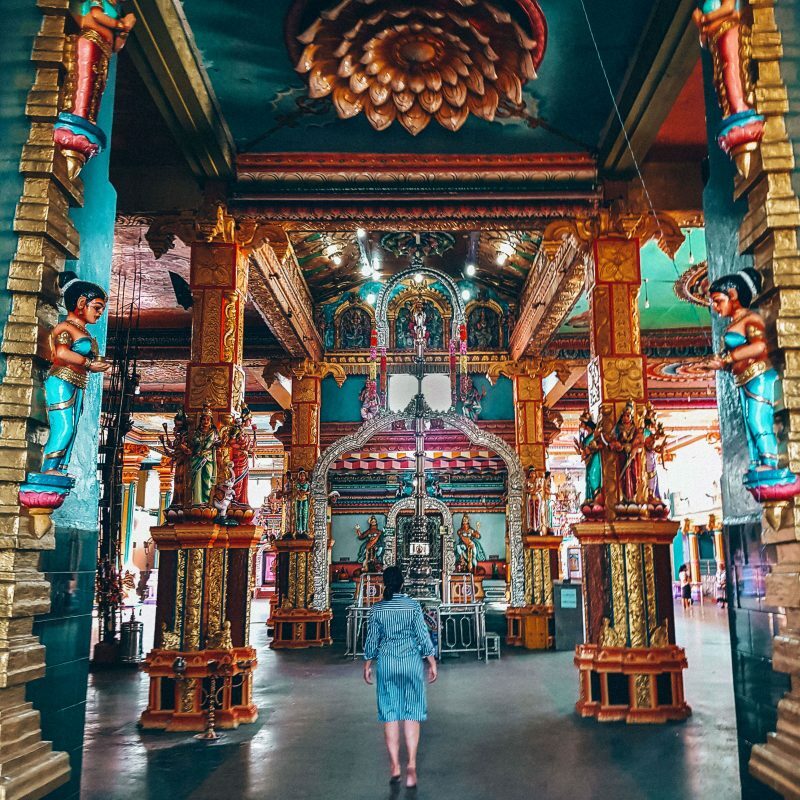 The temple is dedicated to Mariamman, the goddess of rain and fertility. How can you not stop at what once was the largest temple, now it’s the second largest Hindu temple in Sri Lanka. To get inside you need to pay entrance and take off your shoes. I love Hindu temples, they are so colorful and with so many drawings it’s really fascinating. Kandy, the second largest city in Sri Lanka, you should know that there was a curfew a week before we arrived in Kandy. We almost had to skip Kandy due to the situation that happened a couple of weeks earlier in Kandy. There was a riot between Buddhists and Muslims which escalated quickly and they had to close the whole of Kandy. You could still see a lot of law enforcement while entering Kandy but besides that it was a vivid and a life city. 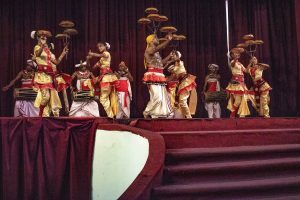 Kandy is a town build around a small lake and likes to honor traditions. 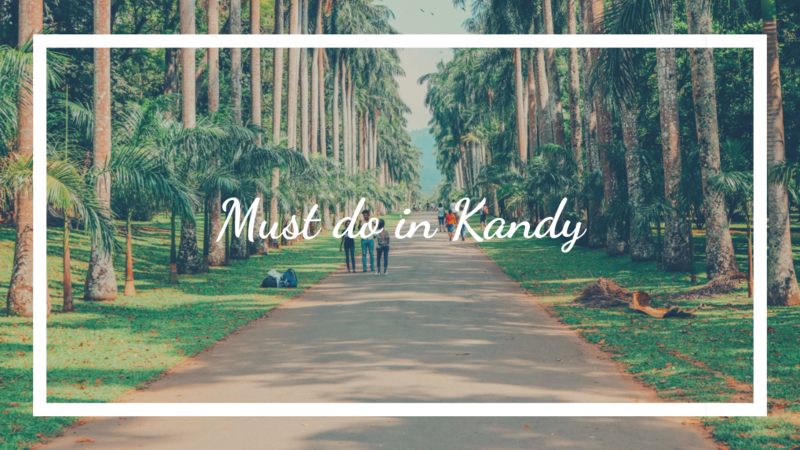 Here are the things we did while we were in Kandy and You must do too! We arrived late in the afternoon so we didn’t have so much time to go and explore, but we did visit the Tooth temple. What an experience is that! Rituals are performed three times daily: at dawn, at noon and in the evening. That’s when the room is open for worshippers and tourist to see the tooth, well actually you don’t really see the tooth, which is kept in a small box, a stupa, kind of a special box. Which contains a series of six dagoba ( stupa) caskets of diminishing size. First of all you need to cover up of course, take off your shoes and pay a fee. Loads of people come here so be patient. You can walk around and listen to a freelance guide (don’t forget to tip), give your offering and go to the ‘garden’ and light up a candle. Or you can do like us, stand in line for quite some time to see the room of the tooth ‘briefly’ and give your offering. You’re not allowed to take pictures during that time due to the respect for privacy and worshippers. Afterwards we went to drinks at sky lounge , that has an amazing view, the perfect way to end our first day in Kandy. The next day we left to the botanical gardens after breakfast, this is a MUST VISIT place when in Kandy. 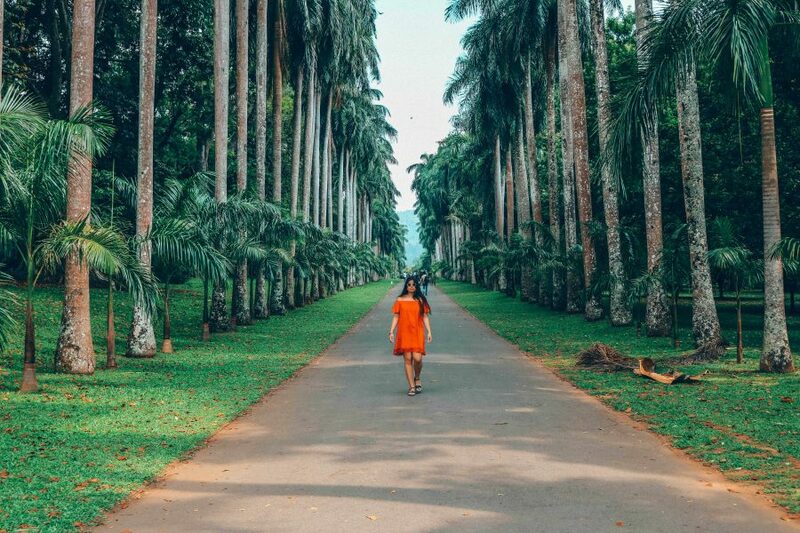 Here is where most epic Instagram pictures are taken because of the avenue of royal palms. Like all sorts of orchids, Burma bamboo etc.. 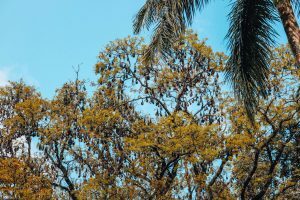 If you hear a weird squeaking sound don’t be alarmed, the garden is filled with thousands of fruit bats, and it’s actually really amazing, I’ve never seen something in the wild like that. You should see it when the night falls, than they all come out to eat. There is a small café near the entrance but honestly a bit overpriced, I suggest to bring your own pick nick. After lunch we went to Udawattakele Forest reserve, the forest is known for bird watching and is a nice walk. Once it was called ‘the garden above the royal palace’ and now locals even say it’s like a monkey forest ( this is why I actually wanted to go there). 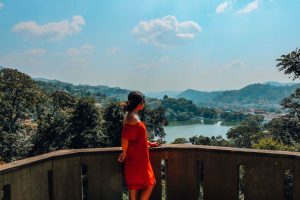 You can do a shorter version like us, you basically walk in a circle, you’ll see an amazing view over Kandy and you can visit a small museum. Most people don’t do this so it’s really quiet and because of that we could even see a deer. 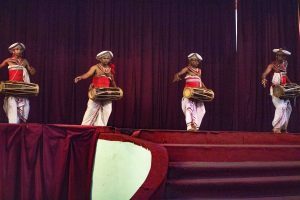 Now for the most touristic attraction in Kandy: watch a Traditional dance. It was a room full of tourists, LOL. I felt like I was in an all in hotel that was about to do the evening show. I guess most people do this with a tour package because you could tell that they came in groups. It was really nice and fun to see but this is not a must do in my opinion, the quality of the dance was not that great, plus it was so hot inside. Good thing our guide fixed us good seats! Well that was a full day although it didn’t feel so tiring. It felt relaxed and not too much we thought it was going to be a tiring day. As we left to a different village we did 1 more stop to end our journey in Kandy. Sri Lanka is known for all sorts of spices and herbs so we had to visit a national herbal garden. There is a guide that shows you what each herb does, an easy example is aloe Vera. It calms the skin, hydrates and makes the skin super soft. Sri lanka is really into alternative medicine. On top of that you can get a quick taste of Ayurveda treatment. It was a lot of fun, the guide made it really pleasant and we actually payed a lot of attention to it. The best thing is : it’s for free, you can support them by buying something in their shop. Kandy has surprised me in a good way. There is a lot to do, to see and I haven’t seen everything in Kandy yet. That’s why I decided to separate Kandy and Ella in a different blog, so stay tuned!